The Perfect Martini is simply one that is perfect for you; starting with good gin and vermouth can make all the difference! I originally created this post to celebrate the one year anniversary of Friday Cocktails…and that was FIVE years ago! A lot has changed since then but one thing has not. This is still my way to make a perfect martini and I thought a reboot in order. While I have lamented my desire to hang on to summer for dear life; today it’s clear that I’m starting to lose ground. When it’s 59 degrees outside and I’m determined to still have breakfast on the patio you have to start accepting reality. I needed socks and a jacket! So, to that end, I simply could not post another fruity summer drink today (although tomorrow is supposed to be back in the 90’s!). I wanted to make something transitional and nothing really works quite like the martini…it’s a favorite all year round; spring, summer, fall or winter. I read an article once that said a good dry martini is like an Ernest Hemingway short story; deceptively simple (only three ingredients), but the product of a deft, confident hand. You don’t just throw a good martini together – it’s the cocktail that many professional and home bartenders consider the most difficult. 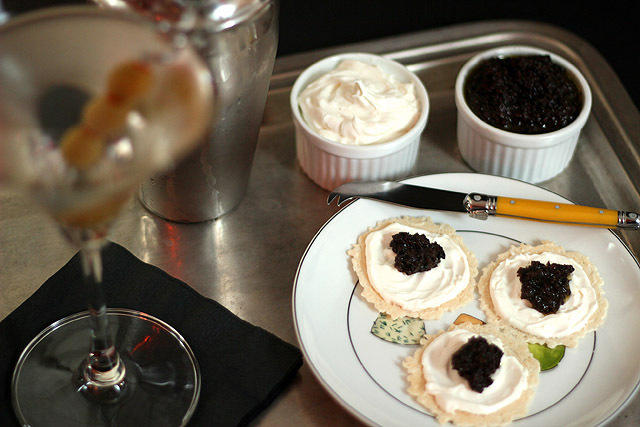 I love to make them at home and I serve them with a simple appetizer too…these crackers with a dollop of cream cheese and black olive tapenade (pretend it’s caviar!) are perfect! I know, in my heart of hearts, that in it’s purist form, a martini is quintessentially just two things. Gin and Vermouth. Many purists (who the heck are those people anyhow) would cry foul with anything but a lemon twist for garnish but I occasionally like an olive or two (or three) in mine; try them both to find which you prefer. I think as much as the martini itself I just LOVE an olive that’s been marinating in some gin for a bit. Before I ever came to enjoy the cocktail itself I would meet a friend for a couple of drinks on Friday night. 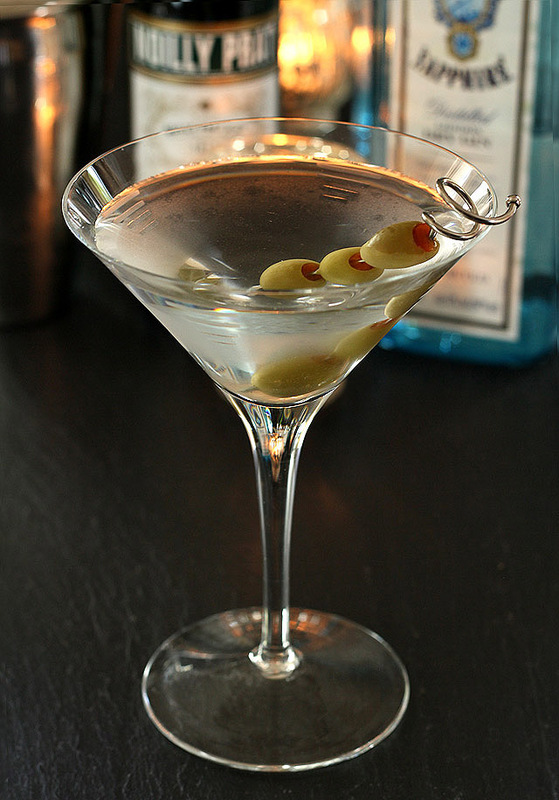 He was a martini man through and through…and I stole his gin soaked olives every chance I could get! With just gin, vermouth and a garnish, it’s a tough act to get just right. Too much gin and it tastes like you’ve ordered it straight, too little and you’ve got a vermouth cocktail. It’s all about balance and personal taste and that personal taste part simply can not be denied; to me it is simply the most important ingredient. The origins of the martini cocktail are diverse and as a result only add confusion to any history. One story tells of a drink made during the gold rush of the 1800s in Martinez, California, in which barman Julio Richelieu mixed a drink he called “The Martinez,” that was comprised of one part Sauternes wine with three parts gin, garnished with an olive. Another attributes the name to a rifle used by the British Army in the late 1800s called the Martini and Henry and yet another story gives credence to a New York bartender in the 1900s who mixed a drink comprised of equal parts London Dry Gin and Noilly Prat vermouth with orange bitters. The arguments on how to best make the perfect martini are as many as the stories of origin. What kind of Gin? Beefeaters may often be cited as the gin of choice but I still love Bombay Sapphire. Chill everything to within an inch of its life or do you just chill the glasses? How much vermouth? I’ve heard that some prefer such a delicate whisper of vermouth that you should pour the vermouth first, swirl it in the glass and then empty it before adding gin…now that is a DRY martini! More choices? Lemon twist or olives. Shaken or stirred? Remember the purists? They will rise up and claim that vigorous shaking “bruises the gin,” whereas others swear that you need to shake the cocktail to chill it to the right temperature. Can you see how that personal preference ingredient is so important?. Personally? I like mine shaken; I like them ice cold and I’m OK if the shaking tempers the alcohol with a bit of water…that’s MY preference! Maybe the reason it is so difficult to make the perfect martini is because with so few ingredients and all of those personal preferences, it is almost impossible to discern how others will love one. This is why so many find their perfect martini is one made at home. This recipe is one that suits me; vary the vermouth up or down a bit as you find your nirvana and then garnish as you see fit! Yes, that’s perfect! 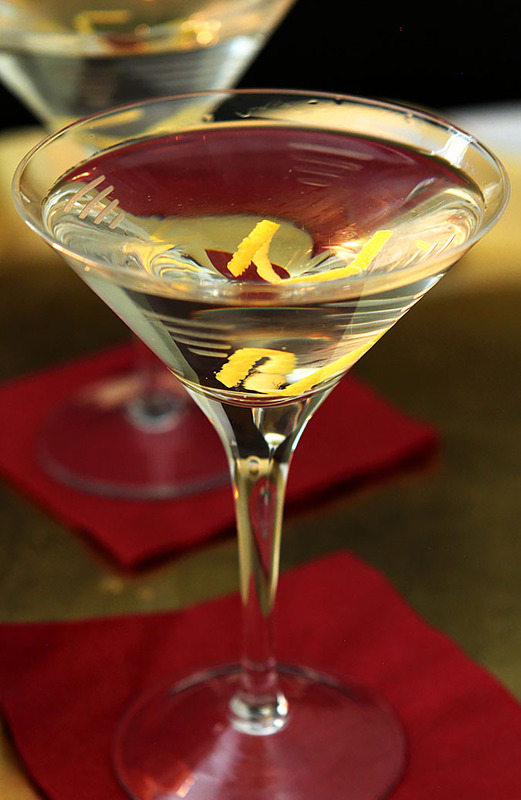 We like our dry martini chilled and powerful, with a good kick from the gin tempered by the vermouth. Pre-chill your shaker, glass, gin, and vermouth. When cold, add ice to the shaker and measure in the required amounts of gin and vermouth. Shake or stir as required. Strain into your chilled glass and twist the lemon peel until it leaves a spritz of lemon oil on the surface of the cocktail; add the lemon to the glass. Alternately, skewer 2 to 3 olives on a cocktail pick and put into the martini glass. Serve, holding by the stem. Put the olives, salt, and garlic in a blender on low and blend while slowly drizzling in the olive oil. Increase the speed a bit and blend until combined. I like mine to be almost smooth but still just a tiny bit chunky. Chilling all of your components is critical. The ice will take the cocktail to a super chill which won't be tempered by warm glasses. Love me an almost icy martini! Thank you for sharing your wonderful and amazing talents with us….. Combine scotch, lemon juice and simple syrup in a cocktail shaker filled with ice. Shake vigorously 10-12 times and strain into an ice-filled rocks glass. My favorite cocktail is a manhattan, closely followed by a madras. Barb, what a lovely post–it all came together beautifully! I’d have to say my favorite cocktail is a Whiskey Sour. It’s right up there with a Tom Collins. These days I’m enjoying bourbon, so I make a mint julep using mint from our garden and stevia (instead of sugar syrup) to keep the calories down. My favorite cocktail is one my aunt makes, it’s tequila, amaretto and squirt soda, crazy but good. My favorite cocktail is a basic vodka cranberry… but all of yours look so good that I’m going to have to start making some! Mmmmm! Love your martini shot Barb. This is my favorite cocktail! Gotta say I love a well made martini! So loving this perfect martini post! Your olive spread is a winner and I will be making soon!!! Happy Sunday!!! Oooh am I loving each and every one of these cocktails! I have to say that other than being particularly partial to the two boozy desserts 😀 I am dying to taste anything berry! Love! Sweet, fruity, berries or cranberries just make a drink for me. And Cookin Canuck’s Grapefruit Greyhound is intriguing! I have to say that I had my very first martini (and the only time I drank them) when I was in Nigeria. Seemed to be the expat drink! I always thought the olives were the best part of the cocktail, but then, as I said, I’m a fruity berry girl. Love this amazing round up. And don’t I LOVE a good olive tapenade! Fabulous! I follow @FridayCocktail on twitter. Yes, I LOVE your baskets of goodies!!! What great prizes! Wow, such a beautiful line up of cocktails, love all the colors, glasses, variations etc. WOOHOO! Congratulations Barb! I wish I could come for the REAL cocktail party! With the gorgeous round up like that I think I’d be there for a lonnnnng time. Heh. Here’s to another delicious year to come! I can’t believe I never saw anything on the cocktail Friday before until now where I all of a sudden see beautiful cocktails popping up everywhere. Congratulations on the one year anniversary and congratulations with your daughter too!! I’m a vodka tonic with a lime twist kind of girl. And that White Russian Milkshake above looks so yummy! I don’t think I’ve ever had a cocktail – that seems a little shocking, really! But anything with Bombay Sapphire gin can’t be bad, can it? Thanks so much for inviting me to join the celebrations, Barb – it’s been fun! So mad that I missed a year of cocktail Friday. Really going to have to go back and check them out! One of my favorite cocktails is a vodka gimlet! Such a hard choice to make amongst such great looking drinks. I have long been a fan of the Corpse Revivor tho, and that is gonna be the drink for me. I love the classic mojito. So fresh! So many,but a good mint julep or Irish coffee is fine by me. I like a good gin and tonic. I, too, liked Bombay but I now prefer Plymouth gin with 2 lime slices! I am an idiot and forgot to make a cocktail and post it. I love you though and well you know I am a bit verklempt. I live Manhattans the best. My favorite cocktail? Even though I made a Scarlett O’Hara for your celebration, my favorite is actually gin and tonic! I’ve always like Long Island Iced Tea but it usually only takes one to knock me out! It’s Kentucky bourbon, straight up, for me! Your martini does look perfect and I love your olive tapenade crostini! I think I like mine shaken. Because the temperature is important to me. So interesting to read all about The Perfect Martini and yours looks perfect, as have all the drinks you’ve mixed here for us. Happy #FridayCocktail anniversary and thanks for these fun prizes!! *everyone’s drinks look so pretty:)CHEERS! 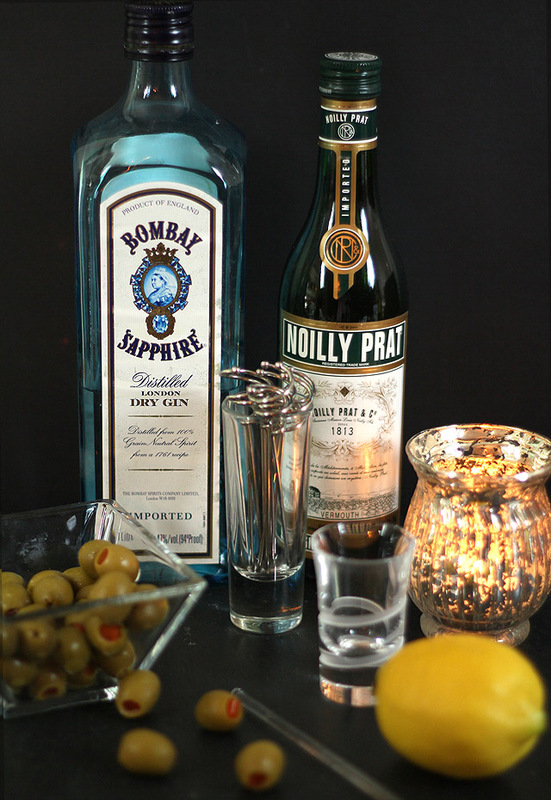 I love a good drink with Bombay Saphire – great minds! However, my favorite drink right now is an Aperol Spritz 🙂 Loving Aperol and Campari lately! i’m an old fashioned gin & tonic with a twist kinda girl. thanks for a chance at the giveaway! My favorite cocktail is a peach daquari. So good on a hot night! I love a lemon drop in a tall glass filled with ice. Great round-up! Kind of wish I made a more exotic, ‘real’ cocktail. Maybe soon! Happy one year..looking forward to the next! This is awesome! All of the cocktails look amazing and make me want to be more of a “drinker’! I’ve only tried a martini once and it was made by my brother in law, who I’m sure had no clue what he was doing! I would imagine yours would win me over! Of course I follow you on twitter and I’m off to subscribe to your feed. I have to pick just one cocktail I like. That is really hard. It depends on my mood and the season. I love a chocolate martini in winter, a lilac martini in spring, a gin and tonic in summer, and I always love a long island iced tea in fall. So that’s one for each season. Ohh and I love eggnog too. Does that count as a cocktail? I’ve rediscovered my love for a classic rum and coke. Dark rum, Coca Cola. Squeeze of fresh lime brings me back to Dominican weekends at the beach! I love margaritas on the rocks with salt on the rim. YUM! I just found your blog through Gourmande in the Kitchen – how fun! I was a rum & Coke drinker, but have moved to Cosmopolitans. I think your blog will broaden my horizons! Happy birthday/anniversary – and many more! Am a newcomer to your blog, love cocktails and am on a mission to explore! I love the submission by Amanda from Lambs’ Ears and Honey with St Germain! 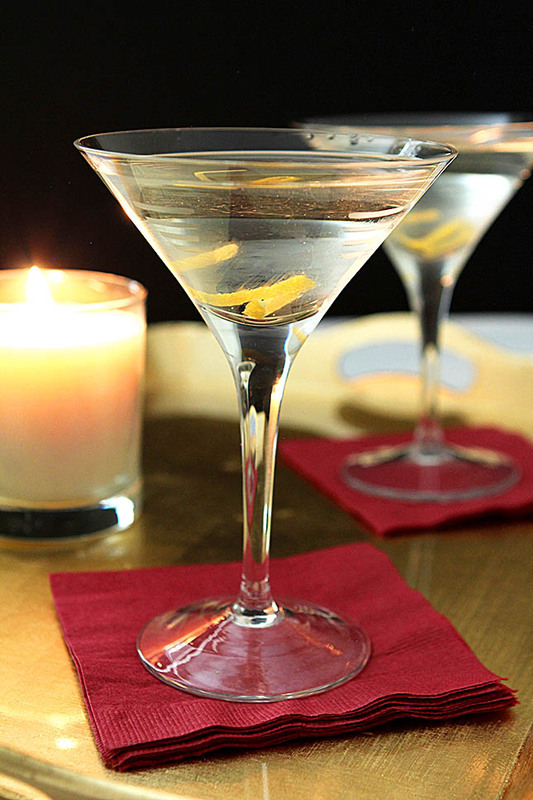 I mix it with Citadelle Gin 1:2 martini-style with a grapefruit twist! Congratulations, Barb! Thanks so much for inviting me to the party. You have a spectacular spread. You really know how to throw a party!! And HAPPY BIRTHDAY LAUREN!! Hope it’s a great one! And I would say the Chocolate Champagne Float is my favorite. Each one is spectacular! My fave cocktail is Cuarenta y Tres (43 Liqor) http://www.licor43.com/ with a squirt of Meyer lemon juice in it, on the rocks. Happy Anniversary! You did it and how! What an amazing party we have going on here! Wish you Many more to come! My Favorite one is the blood orange Margarita you made! It is out of this world! Happy Anniversary! It is hard to believe that it has been one year! I still enjoy a well made, not too sweet Cosmo every now and then. Cheers! Happy anniversary to The Friday Cocktail … and happy birthday to Lauren!!! I love a French 76—1/2 shot of a good vodka, with champagne and a dash of lemon juice. i like a traditional mojito in the summer and a white russian or just plain bailey’s in the winter. White Russian Milkshake for me!! Thanks StarFoods for directing me here! And a very happy birthday to your ‘baby’..
My favorite is a rum & diet coke with lime wedge! Congratulations Barb! What an amazing assortment of cocktails! I know I cant enter the competition from over here but wanted to say hi and cheers! My favorite cocktail on the list is the pink grapefruite greyhound. Wow, you’ve got such loot and plunder. Hope I get lucky. I want to make the black olive spread. Can it be olives from a can? My favorite drink is a French 75. Would you believe I have yet to enjoy a traditional martini? I’m hoping I just haven’t had it made the way I like yet… Happy Friday Cocktails! My favorite cocktail? Pimm’s cup or a good ole gin ‘n tonic. Well, I’m pregnant right now, so I can’t try any just yet, but that peach bourbon mojito looks positively divine. And last, but certainly not least… HAPPY BIRTHDAY LAUREN!!!! i like Nuts and Berries. It’s Chambourd, Frangelico and cream. I like to try new drinks but I have to say that one of my favorites is a mojito. My favorite was consumed in the Little Havana neighborhood of Miami. Brings back great vacation memories. I don’t have a favorite but I’m very partial to sweet fruity drinks. One of my favorites is a pomegranate martini. My favorite cocktail is a vodka tonic. I experiment often and am always willing to try new things, but I always seem to go back to these. Your Friday Cocktails are something I look forward to each week, Barb! It’s such a fabulous series. Thanks so much for including me in your party. As for my favorite cocktail…kamikazes, hands down. Just discovered your site from my friend Elle of Elle’s New England Kitchen. Awesome and beautiful pictures. Definitely trying the vodka and root beer b/c I love everything with vodka. Happy Celebration, Barb! Congratulations on a great year of cocktails, so glad to be joining you in the party today. Your post is wonderful– so much information, beautiful photos and a great drink. I’ll be back later to join in the giveaways– what fun!! Here’s to you! Woo hoo! Yay for September birthdays! I don’t think there’s a better way to celebrate than with a nice strong martini! Happy birthday to The Friday Cocktail and your beautiful daughter! What a wonderful celebration and gorgeous round up of drinks…is it too early yet?? What a fun party. First of all, happy birthday to your beautiful Lauren! I wish this was a “real” cocktail party, but I’m afraid I wouldn’t know which of these gorgeous cocktails to choose first. Congratulations to you too Barb for a year of great cocktail recipes. I have enjoyed every one. Thanks for hosting this fantastic party, Barb! And thanks for including me! My favorite cocktail…that’s a toughie. Before I got pregnant, I was getting into Manhattans. HAPPY BIRTHDAY LAUREN!! HAPPY BIRTHDAY FRIDAY COCKTAIL!! What a celebration! Congratulations Barb. A great way to wrap up a truly stupendous year of Friday Cocktail by Creative Culinary. You have set the bar (no pun intended) for how to write and photograph cocktail posts with this project of yours. An example for many, an inspiration for all. Thanks for the party, thanks for the year and all the best going forward.